Tim Ross and Dave LeSueur, Brockville Rotarians who just returned from Nepal, after enduring the earthquake that hit while they were there did a presentation for the Rotary Club of the Thousand Islands. They showed moving photos of their trip there, including before and after photos of the devastation the earthquake created upon Nepal. They were able to attend a Rotary meeting amongst Rotarians from Russia, India, and other places, set-up in their relief camp. Photos of the hotel courtyard where they stayed, the cremation ceremonies, rubble throughout Nepal, and tents all around the country, were also a part of their presentation. They also spoke of the need for low-cost housing, and there is a drive to raise enough funds for 30 houses at a cost of $1000 each. Shelter Boxes were immediately deployed to Nepal, but the need is still there. If you donate to the relief fund “SOS Children’s Villages” the Canadian Government will match your donation. Dave and Tim were given a standing ovation for their courage and strength, and in appreciation for sharing this with us. After the meeting a donation page was set up for Shelter Box. www.DonateBrockville.com will take you there. We got some pledges this week which will put us at least enough for one Shelter Box, the goal was for 4 of them. If you would like to send the information around that is much appreciated. It would be great to reach this goal. 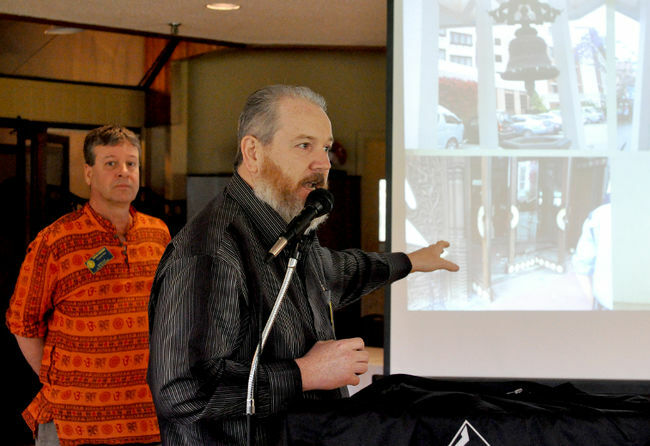 Here is a link to an article about our presentation to Rotary http://www.recorder.ca/2015/05/06/weve-seen-a-lot-of-death Thank you Tim Ross.